In stock -This product will ship today if ordered within the next 2 hours and 47 minutes. 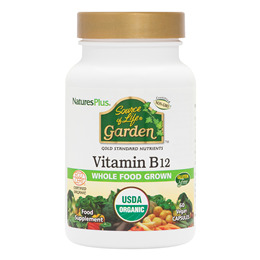 Nature’s Plus Source of Life Garden Vitamin B12 with Organic Gold Standard Nutrients is a certified organic supplement which helps to provide energy with vitality-boosting vitamin B12 in convenient organic capsules. Guava, Holy Basil, Lemon, Apple, Orange, Grape, Blueberry, Strawberry, Cranberry, Beet, Blackberry, Black Currant, Cherry, Pomegranate, Raspberry, Carrot Juice, Bell Pepper Red, Cucumber, Sweet Potato, Broccoli, Spinach, Mango, Papaya, Wild Bilberry, Cinnamon, Kale. Certified Organic Whole Food Blend, organic rice maltodextrin, organic capsule (pullulan prebiotic polysaccharides [from Aureobasidium pullulans]), organic potato starch, methylcobalamin and organic rice protein. As a food supplement for adults, take 2 capsules once daily. Do not exceed recommended serving. Not a substitute for a varied diet. If you are taking any medications consult your health care practitioner before using any herbal product. 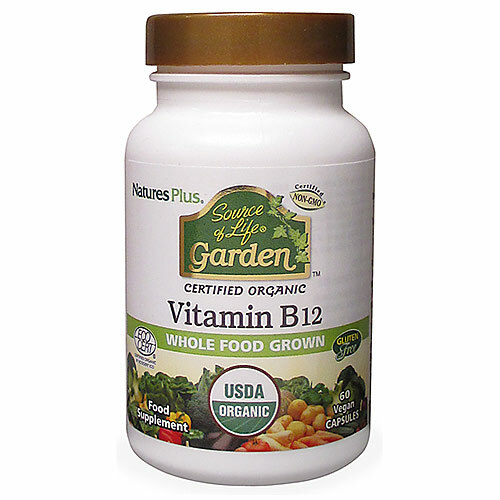 Below are reviews of Source of Life Garden Organic Vit B-12 - 60 x 1000mcg Caps by bodykind customers. If you have tried this product we'd love to hear what you think so please leave a review.